Background: Radiofrequency ablation (RFA) is a safe, highly effective, and novel method used to treat benign thyroid nodules. This study aimed to evaluate the efficacy and safety of a combination of RFA and hydrodissection for treating benign thyroid nodules larger than 2 cm. Materials and Methods: The data of 137 patients with at least one thyroid nodule ≥2 cm who underwent RFA combined with hydrodissection at our medical center from November 2014 to October 2016 were analyzed. Ultrasound-guided RFA was applied to 532 nodules, including 139 nodules ≥2 cm and 393 nodes <2 cm. Results: The volumes of thyroid nodules, complications, and changes in thyroid function were analyzed. Ablation treatments were successfully performed without intraoperative skin burns, serious bleeding, or serious thyroid storm. 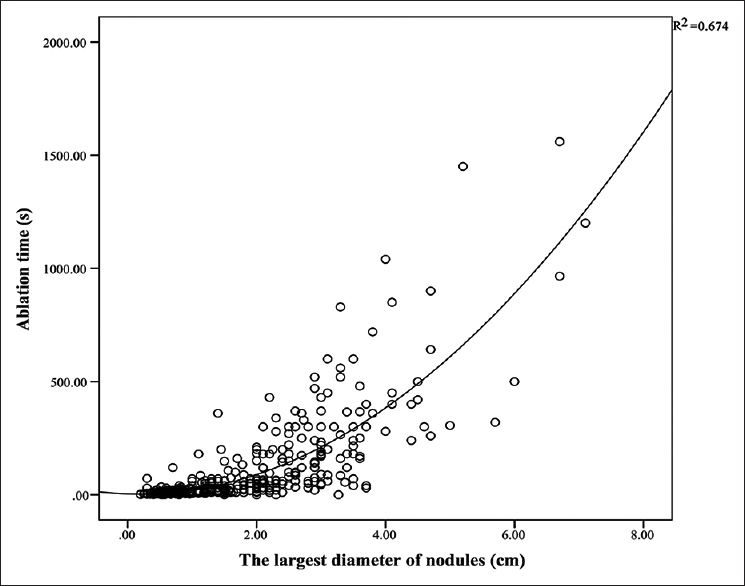 A positive correlation was observed between ablation time and nodule size (R2 = 0.674). Only one patient (0.7%) experienced laryngeal nerve injury after operation. Moreover, the results of thyroid function tests (free triiodothyronine, free thyroxine, and thyroid-stimulating hormone) remained within normal ranges both before and after ablation. The complete ablation rate was 99.06%. The volumes of both nodules ≥2 cm and <2 cm significantly decreased after ablation. Six months after ablation, the average volume of nodules ≥2 cm had decreased to 1.02 ± 2.42 mL, and the volume reduction ratio was 83.11%. Clinically, although thyroid nodules are generally benign, malignant solid components are occasionally seen. Moreover, these nodules may cause a range of worrisome signs and symptoms, including vocal hoarseness, rapid lesion growth, dyspnea, dysphagia, and related lymphadenopathy. Therefore, a timely and effective treatment for thyroid nodules is urgently needed. In recent years, radiofrequency ablation (RFA), a novel and minimally invasive treatment, has been widely applied for the treatment of recurrent thyroid cancers and benign thyroid nodules.,, Ultrasound-guided RFA has been confirmed as an effective and safe treatment option for benign thyroid nodules. However, the thyroid gland is small and surrounded by complex structures, and therefore, ablation remains associated with some complications, especially during the treatment of large nodules located near (<2 mm) the surrounding tissues. Recently, we found that the efficacy of ultrasound-guided RFA for benign thyroid nodules correlated closely with the nodule size. In addition, when treating nodules in proximity to important neck structures, including the recurrent laryngeal nerve, common carotid artery, trachea, and esophagus, the ultrasound-guided radiofrequency electrode was placed in the dangerous triangular area containing the thyroid capsule and recurrent laryngeal nerve. Accordingly, these important structures were at risk of incurring damage during the procedure. Advanced techniques, such as vascular ablation and hydrodissection, have also been developed to improve efficacy and minimize complications. In this study, we combined hydrodissection with RFA for the treatment of benign thyroid nodules (≥2 cm) proximal (within 2 mm) to the surrounding tissues. The safety and efficacy of this combined treatment method were analyzed. Obvious compressive symptoms, a relative large nodule volume, local uplift, or nodules classified as TI-RADS (Thyroid imaging reporting and data system for ultrasonography) 4a or higher, which led to concerns about malignancy and a wish to undergo treatment. Serious neurological, psychiatric, and physical diseases. This study met the requirements of the Declaration of Helsinki (1975) and was approved by the ethics committee at our hospital. All patients were informed about the risk of complications, and all of them provided written informed consent to participate preoperatively. All patients underwent a preoperative high-frequency ultrasound assessment of the thyroid. The Twice ultrasound system (Esaote, Genova, Italy) with L522 and L523 probes and a set center frequency of 7–10 MHz was applied for thyroid assessment. SonoVue (Sine Pharma, Milan, Italy) was used as the ultrasound contrast agent. Eight indicators were detected: thyroid nodule morphology, echo type, nodule aspect ratio, microcalcifications, nodular edge, posterior acoustic type, internal blood flow, echotexture, and metastasis to the neck lymph nodes. Preoperatively, all patients were placed under general anesthesia with tracheal intubation. A shoulder and neck pillow were used. The patients were placed in the neck hyperextension position, and with routine prepping and draping were applied. Methylprednisolone was administered prophylactically before RFA. Monopolar RFA was performed using a Generator S-500 (Medsphere, Shanghai, China) with a power of 20 W in impedance mode. An 18G (outer diameter) electrode (Medsphere; catalogue number: 10-141361) with an ablation area length of 0.5 cm was used in this study. The most appropriate electrode puncture site was the middle of the neck near the thyroid isthmus. The radiofrequency electrode was inserted into the bottom of the tumor under ultrasound guidance. Gasification began when the RFA device was turned on, and the nodule was gradually covered by a strong echo. Patients enrolled in this study all had at least one large benign thyroid nodule. To ensure complete coverage of these large nodules, multilevel ablation and multiplane puncture were applied by modulating the ablation plane and electrode direction. The efficacy of RFA was evaluated using contrast-enhanced ultrasound technology. If the nodules were not ablated completely, complementary ablation was performed to decrease the volumes of the residual nodules. After ablation, contrast agent perfusion in the nodules was detected by contrast-enhanced ultrasound. Thyroid nodules in close proximity to important neck tissues, including the recurrent laryngeal nerve, common carotid artery, trachea, and esophagus, required placement of the ultrasound-guided radiofrequency electrode in the dangerous triangular area containing the thyroid capsule and recurrent laryngeal nerve. Therefore, an appropriate amount of saline solution was injected between the thyroid capsule and common carotid artery to form a liquid barrier of at least 5 mm [Figure 1]. This barrier could prevent RFA from damaging the important local tissues. Notably, this liquid barrier was necessary for the RFA treatment of large benign (≥2 cm) thyroid nodules located closely to the surrounding tissues. After ablation, patients were followed up at 1, 3, and 6 months, and the variation of these time points was within 5 days. Various indexes, including the patients' general conditions and complications, were recorded and analyzed during the follow-up. The thyroid was observed using high-frequency ultrasound and ultrasound imaging. Thyroid conditions, including the ablation volume, echo type, contrast agent perfusion, and internal blood flow, were recorded regularly during follow-up. Changes in the thyroid nodules and volumes were recorded, and the degree of ablation was determined to evaluate the efficacy of the procedure. Complete ablation or residual ablated lesions were determined based on the perfusion condition. Two-dimensional ultrasound was used to measure the volumes of thyroid nodules (V, calculated using Eq#1). 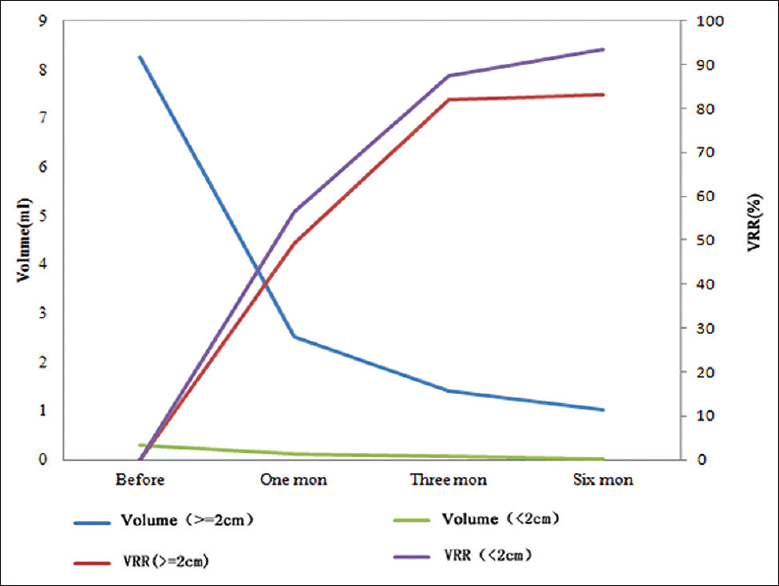 The volume reduction ratio (VRR) was an important indicator reflecting the reduction of the ablated lesions. In this study, related indexes, including the VRR and the reduction rates of ablated lesions at 1 (VRR1) and 3 months after ablation (VRR2), were calculated using Eq#2. The complete ablation rate (CAR%) was calculated using Eq#3. Eq#3: CAR% = number of nodules achieved complete ablation (N)/total number of nodules (N) × 100%. SPSS, version 22.0 (IBM Co., Armonk, NY, USA) was used to perform all statistical analyses. Continuous parameters are expressed as means ± standard deviation, while categorical variables are expressed as percentages. An independent t-test was applied for continuous variables, and the two-degree polynomial model was used to evaluate correlations between variables. P < 0.05 was considered to indicate statistical significance. A total of 137 patients with 532 nodules were analyzed. Thirty-three patients (24.1%) had a single nodule and 104 patients (75.9%) had multiple nodules. Each included patient had at least one nodule with a largest diameter ≥2 cm. A total of 139 were nodules larger than 2 cm. The 393 smaller nodules were all treated during the ablation procedures [Table 1]. All patients underwent ablation therapy without serious bleeding, serious thyroid storm, or skin burn events. The ablation times ranged from 2 to 1200 s, with an average of 52.4 ± 143.1 s. There was a significant positive correlation between the ablation time and nodule volume (R2 = 0.674, P < 0.01) [Figure 2]. In all patients, the thyroid function indexes, including FT3, FT4, and TSH, remained within normal ranges both before and after ablation therapy. In other words, RFA treatment did not induce hypothyroidism [Figure 3]a. Regarding the levels of antibodies specific for thyroglobulin antibody (TG-Ab) and thyroid peroxidase antibody (TPO-Ab), no significant differences were observed after RFA therapy in patients with normal preoperational levels of both antibodies. 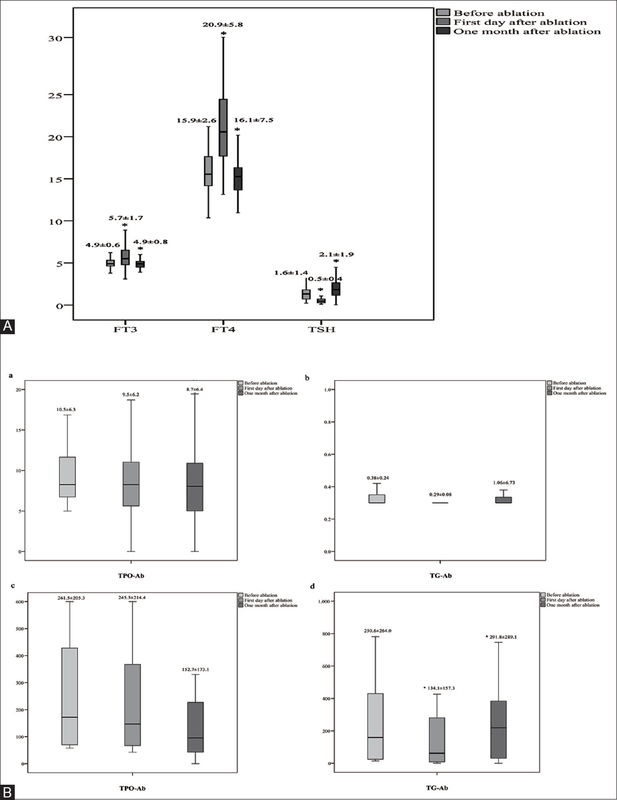 However, patients with abnormal preoperative levels of TG-Ab and/or TPO-Ab exhibited reductions in the average values of these antibodies on the 1st postoperative day; furthermore, the change in the TG-Ab level was significant [Figure 3]b. After ablation, all patients' symptoms were relieved without surgical scarring of the neck. Complete ablation was achieved in 527 nodules (99.06%) after the operation [Figure 4]. Residual tissue was observed for only five nodules >2 cm that were adjacent to the recurrent laryngeal nerve and trachea. These latter nodules were not treated further because the residual tissue exhibited no change during the follow-up period. All nodule volumes were significantly reduced after ablation [Table 2]. For nodules ≥2 cm, the average volumes before and 1, 3, and 6 months after ablation were 8.25 ± 11.69, 2.53 ± 2.85, 1.40 ± 2.11, and 1.02 ± 2.42 mL, respectively. For nodules <2 cm, the corresponding values were 0.29 ± 0.44, 0.12 ± 0.28, 0.07 ± 0.28, and 0.02 ± 0.07 mL, respectively. Although the VRRs at 1 and 6 months were significantly lower in the ≥2 cm nodule group than in the <2 cm nodule group, the 6-month VRR in the former group reached 83.11%, and the nodule volumes were significantly reduced at 6 months [Figure 5]. Clinical symptoms, including voice changes, severe pain, skin burns, hematoma, and nodule rupture, and US findings, were assessed during the process of RFA. After RFA treatment, 99.27% patients improved without sequelae. Only one patient experienced temporary vocal cord paralysis after operation, which presented as a cough while drinking and hoarseness. Fortunately, the symptoms of coughing while drinking and hoarseness disappeared without treatment after 2 weeks and 2 months, respectively. Surgical resection has long been used to treat benign thyroid nodules, particularly in cases with large nodules. By contrast, RFA is a relatively new medical procedure involving an electrical conduction system to ablate a tumor or dysfunctional lesion in the heart or other tissue using heat generated by medium frequency alternation. The advantages of this technology include a minimally invasive nature and lack of significant collateral damage. Notably, general anesthesia may provide superior results during the RFA treatment process in anxious patients. In this study, general anesthesia was selected for the following reasons: (1) ablation still carries a risk of intraoperative complications, especially for large nodules near surrounding tissues. (2) Timely and accurate monitoring of vital signs could be achieved. (3) The intraoperative influence of swallowing movement could be avoided. (4) Side effects of local anesthesia, such as discomfort, pain, and coughing, could be avoided during the ablation. Furthermore, the liquid barrier used to separate nodules from the surrounding tissues could cause significant pain in patients under local anesthesia, especially for those with nodules near the trachea. The use of general anesthesia could avoid these side effects. (5) General anesthesia could also reduce patients' psychological fears. Therefore, general anesthesia was administered to all included patients in the ambulatory surgery room. Furthermore, only a small hole remained in each patient's neck after RFA. Compared with traditional surgery, RFA technique could better meet a patient's esthetic demands. Most included patients had multiple nodules with sizes of both ≥2 and <2 cm. Thyroid nodules have a low malignant transformation rate, and RFA is not recommended for the treatment of small nodules. Still, most patients remained concerned about potential malignancy and the continued growth of small nodules. Therefore, both nodules ≥2 cm and smaller nodules were ablated simultaneously in each patient. This allowed an analysis of the efficacy of RFA in both nodule size groups. Most importantly, this study confirms the efficiency of a combination of the hydrodissection and RFA techniques. All patients' symptoms disappeared. The VRRs of thyroid nodules ≥2 and <2 cm reached 83.11% and 93.57%, respectively, at 6 months. Similar results were reported in previous studies, wherein the mean cosmetic grading score reached four points and the thyroid nodule volumes decreased significantly after RFA. Mauri et al. compared the efficiencies of RFA and percutaneous laser ablation and found that both techniques were feasible for benign thyroid nodules; although RFA was more rapid, it also required more energy. In addition, Dobrinja et al. reported that one session of RFA did not affect subsequent thyroid surgery or histological diagnosis. Wong et al. compared the efficacies of RFA and other ablative options in the current literature and confirmed that RFA is an effective nonsurgical technique for treating benign thyroid nodules. However, they also noted the weaknesses of RFA treatment, including a definitive histology and incomplete nodule ablation. In this study, surveillance of the residual thyroid masses was included to address these problems. According to Mainini et al. current reports indicate a mean volume reduction of 47%–84% at 3–6-month post-RFA. Pacella et al. 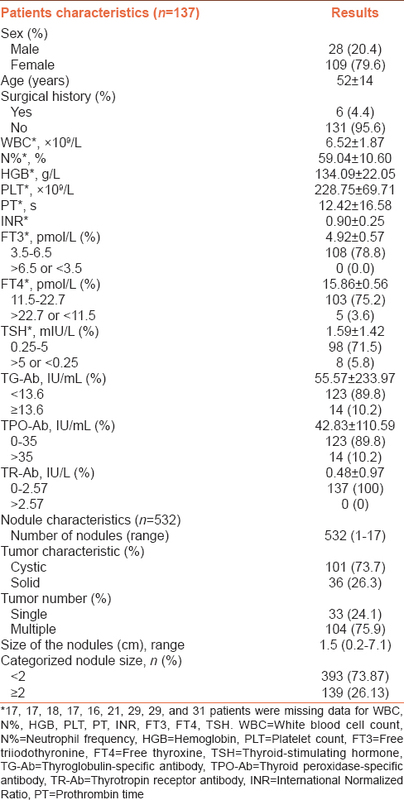 reported mean nodule reductions of 57 ± 21% and 70 ± 19% at 6 and 12 months after RFA. The efficacy of RFA in our study was, therefore, competitive. Safety is also an important index for clinical applications. Bernardi et al. compared the safety outcomes of RFA and surgery and reported that RFA caused fewer complications and less pain although it was more expensive. Moreover, Zhang et al. found was no significant difference in thyroid function after RFA surgery and reported an adverse reaction rate of 29.79%. As shown in this study, the thyroid function indexes (e.g., FT3, FT4, and TSH) of all patients remained within normal ranges both before and after ablation therapy. Although the average values of FT3, FT4, and TSH changed after ablation, all remained within normal ranges, indicating that this therapy did not induce hypothyroidism. However, other indicators of thyroid function, such as thyroglobulin and the thyrotropin receptor antibody, were not analyzed in this study. Therefore, the effects of ablation on thyroid function require further analysis. Furthermore, Ugurlu et al. reported that 33 patients with benign symptomatic thyroid nodules who were treated using RFA reported no complaints other than pain (12%). At present, there are no indications for RFA treatment, and hospitals, therefore, apply different diagnostic and treatment standards. In this study, a power control mode using low-power, short-duration, multiplanar, and multi-point ablation was adopted to improve the controllability and accuracy of the ablation range. Although the RFA complication rate was low, such events may still occur in patients with benign thyroid nodules. According to Mainini et al., the minor and major complication rates after RFA were 4.6% and 1.2%, respectively. Pacella et al. reported a major complication rate of 2.6% (4/152) after RFA. Fortunately, only one case in the present study (0.7%) developed temporary postoperative vocal cord paralysis, which presented as coughing while drinking and hoarseness. These symptoms resolved without treatment at 2 weeks and 2 months, respectively. Consistent with a study by Spiezia et al., patients may develop complications after RFA but would likely recover during long-term follow-up periods. Significantly, the thyroid volume is relatively small, and the surrounding anatomic structure is complex. Therefore, incorrectly performed RFA might damage important adjacent tissues, such as the recurrent laryngeal nerve, esophagus, carotid artery, and skin. Injury of the recurrent laryngeal nerve is the most common complication, with incidence rates of 1.02%–12.5%. As reported by Pacella et al., the operator's skills may be crucial in determining the extent of a nodule volume reduction after RFA. Therefore, efforts should be made to avoid these risks. In this study, hydrodissection was applied in combination with a conventional RFA technique. The liquid barrier could isolate the nodes and surrounding tissues and thus further reduce the impact of RFA on the surrounding tissues. The combination of ultrasound-guided RFA with a hydrodissection technique for the treatment of benign thyroid nodules ≥2 cm was highly efficacious and reduced tissue damage. This method, therefore, appears to be safe and effective for the treatment of benign thyroid nodules located close to the surrounding tissues. However, a prospective controlled study is needed to validate this conclusion. All patients were informed about the risk of complications and provided written informed consent before their operations. This study was funded by the Project from Shanghai Science and Technology Committee (No. 16441901100). Filetti S, Durante C, Torlontano M. Nonsurgical approaches to the management of thyroid nodules. Nat Clin Pract Endocrinol Metab 2006;2:384-94. Sathyanarayana BA, Ramachandra J, Sinha SK, Nandeeshkumar GN, Tejasvi KC. Clinical study of thyroid malignacies and the role of serum TSH in predicting malignancies. Gangtie 2013;2:8386-92. Sung JY, Kim YS, Choi H, Lee JH, Baek JH. Optimum first-line treatment technique for benign cystic thyroid nodules: Ethanol ablation or radiofrequency ablation? AJR Am J Roentgenol 2011;196:W210-4. Kim HY, Ryu WS, Woo SU, Son GS, Lee ES, Lee JB, et al. Primary papillary thyroid carcinoma previously treated incompletely with radiofrequency ablation. J Cancer Res Ther 2010;6:310-2. Long B, Li L, Yao L, Chen S, Yi H, Ye X, et al. Combined use of radioiodine therapy and radiofrequency ablation in treating postsurgical thyroid remnant of differentiated thyroid carcinoma. J Cancer Res Ther 2015; Suppl 11:C244-7. Tang X, Cui D, Chi J, Wang Z, Wang T, Zhai B, et al. Evaluation of the safety and efficacy of radiofrequency ablation for treating benign thyroid nodules. J Cancer 2017;8:754-60. Esnault O, Franc B, Ménégaux F, Rouxel A, De Kerviler E, Bourrier P, et al. High-intensity focused ultrasound ablation of thyroid nodules:First human feasibility study. Thyroid 2011;21:965-73. Park HS, Baek JH, Park AW, Chung SR, Choi YJ, Lee JH. Thyroid radiofrequency ablation: Updates on innovative devices and techniques. Korean J Radiol 2017;18:615-23. Ha EJ, Baek JH. Advances in nonsurgical treatment of benign thyroid nodules. Future Oncol 2014;10:1399-405. Kai L, Jia L, Zhi-Gang W, Lei Y. Ultrasonic guided percutaneous ethanol injection with or without combined radiofrequency ablation for hepatocellular carcinomas. Indian J Cancer 2015;52 Suppl 2:e102-4. Giep BN, Giep HN, Hubert HB. Comparison of minimally invasive surgical approaches for hysterectomy at a community hospital: Robotic-assisted laparoscopic hysterectomy, laparoscopic-assisted vaginal hysterectomy and laparoscopic supracervical hysterectomy. J Robot Surg 2010;4:167-75. Aysan E, Idiz UO, Akbulut H, Elmas L. Single-session radiofrequency ablation on benign thyroid nodules: A prospective single center study: Radiofrequency ablation on thyroid. Langenbecks Arch Surg 2016;401:357-63. Lee JH, Kim YS, Lee D, Choi H, Yoo H, Baek JH. Radiofrequency ablation (RFA) of benign thyroid nodules in patients with incompletely resolved clinical problems after ethanol ablation (EA). World J Surg 2010;34:1488-93. Mauri G, Cova L, Monaco CG, Sconfienza LM, Corbetta S, Benedini S, et al. Benign thyroid nodules treatment using percutaneous laser ablation (PLA) and radiofrequency ablation (RFA). Int J Hyperthermia 2017;33:295-9. Dobrinja C, Bernardi S, Fabris B, Eramo R, Makovac P, Bazzocchi G, et al. Surgical and pathological changes after radiofrequency ablation of thyroid nodules. Int J Endocrinol 2015;2015:576576. Wong KP, Lang BH. Use of radiofrequency ablation in benign thyroid nodules: A literature review and updates. Int J Endocrinol 2013;2013:428363. Mainini AP, Monaco C, Pescatori LC, De Angelis C, Sardanelli F, Sconfienza LM, et al. Image-guided thermal ablation of benign thyroid nodules. J Ultrasound 2017;20:11-22. Pacella CM, Mauri G, Cesareo R, Paqualini V, Cianni R, De Feo P, et al. Acomparison of laser with radiofrequency ablation for the treatment of benign thyroid nodules: A propensity score matching analysis. Int J Hyperthermia 2017;33:911-9. Bernardi S, Dobrinja C, Fabris B, Bazzocchi G, Sabato N, Ulcigrai V, et al. Radiofrequency ablation compared to surgery for the treatment of benign thyroid nodules. Int J Endocrinol 2014;2014:934595. 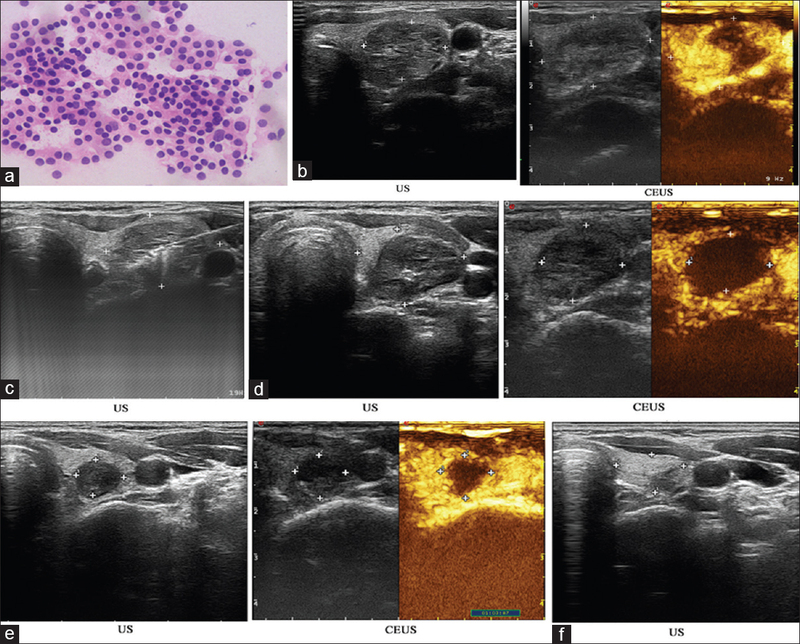 Zhang J, Li X, Lu Z, Wang J, Chen Q, Wu H. Effect and safety of ultrasound-guided RFA in treating benign thyroid solid nodules. Clin Med 2016;36:46-8. Ugurlu MU, Uprak K, Akpinar IN, Attaallah W, Yegen C, Gulluoglu BM. Radiofrequency ablation of benign symptomatic thyroid nodules: Prospective safety and efficacy study. World J Surg 2015;39:961-8. Diao C, Cheng RC. The myth and thinking about radiofrequency ablation for thyroid nodules. Med Philos 2015;36:16-21. Kim C, Lee JH, Choi YJ, Kim WB, Sung TY, Baek JH. Complications encountered in ultrasonography-guided radiofrequency ablation of benign thyroid nodules and recurrent thyroid cancers. Eur Radiol 2017;27:3128-37. Spiezia S, Garberoglio R, Milone F, Ramundo V, Caiazzo C, Assanti AP, et al. Thyroid nodules and related symptoms are stably controlled two years after radiofrequency thermal ablation. Thyroid 2009;19:219-25. Kot BC, Ying MT, Brook FM, Kinoshita RE, Cheng SC. Ultrasonographic assessment of the thyroid gland and adjacent anatomic structures in indo-pacific bottlenose dolphins (Tursiops aduncus). Am J Vet Res 2012;73:1696-706. Na DG, Lee JH, Jung SL, Kim JH, Sung JY, Shin JH, et al. Radiofrequency ablation of benign thyroid nodules and recurrent thyroid cancers: Consensus statement and recommendations. Korean J Radiol 2012;13:117-25. Wang LF, Lee KW, Kuo WR, Wu CW, Lu SP, Chiang FY. The efficacy of intraoperative corticosteroids in recurrent laryngeal nerve palsy after thyroid surgery. World J Surg 2006;30:299-303.